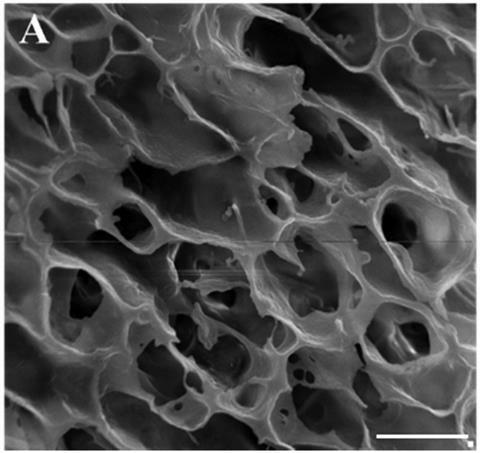 A scanning electron microscope image of the tofu scaffold revealed that the surface of the pores was rough, which could promote cellular adhesion and infiltration within scaffolds and facilitate nutrient transfer from the host tissue more easily. The team found that freeze-dried tofu could support the growth of fibroblast cells. Soybeans, from which tofu is made, are a rich source of vitamins and minerals, and contain almost all of the essential amino acids. The researchers suggest that pores within the tofu facilitated nutrient transfer to the cells and that the pores’ rough texture promoted cellular adhesion. The team successfully transplanted the fibroblast cells and scaffold into the subcutaneous submucosal layer of rats and the transplant showed good biocompatibility and biological integration with tissues surrounding the implantation site. The researchers suggest that cells grown on tofu scaffolds could find use in wound healing.